Alex ,an African Grey parrot , died in September at the age of 31. His last words to his longtime trainer, animal psychologist Irene Pepperberg, were, "You be good. I love you." The words themselves bring a lump to my throat. The bird knew he was dying and his last words were what my father would have said to me. After rubbing his beak on an object, he could correctly name what it was made of  "wool," for example. When he tired of an experiment, he'd say, "Wanna go back" (to his cage). When he sensed that Pepperberg was losing patience with him, he'd say, "I'm sorry. "When Alex asked for a treat  say, a grape  that's exactly what he wanted; he'd reject anything else offered him until he got the grape. The scientists say that every parrot  and every bird perhaps, is as smart. "We're too invested in the idea of our superiority to understand what an inferior quality it really is. I always wonder how the experiments would go if they were reversedif, instead of us trying to teach Alex how to use the English language, Alex were to try teaching us to understand the world as it appears to parrots." Dolphins, elephants, primates  it is now taken for granted that most mammals have intelligence and emotion akin to that of humans. Even though any bird enthusiast can tell you that birds do too  just by seeing their community interactions, their ability to fly across continents to get to the same tree across the world, their intricate nests, their wars and songs , their love for each other and their care of children , it takes an Alex to make us understand that birds are every bit as intelligent as us and no person in their right minds should keep them in cages. Parrots are social birds whose cognitive and language skills are very high. Unfortunately , instead of trying to understand their own language and communication in the wild , t he ability of some species of parrots to mimic human voices has led to the assault on all species of parrots. Most cannot speak or at best will repeat a few words that are endlessly and moronically pushed on them . In return for this , they become display items condemned to jail forever. Till now parrots were not mentioned in discussions about nonhuman intelligence, much data exist to establish their brain power. Field studies have reported behaviors that are considered as evidence for human-like intelligence. Such behaviors include cooperative alarm signaling in flocks of Indigo macaws and individual recognition in Bahamian Amazons .Another sign of intelligence, thought to be absent in most nonhuman animals, is the ability to engage in complex, meaningful communication. Alex showed that when he was taught a new word or task, that he was capable of using this information in a new way by applying it to a situation where he was not taught the correct response or action. Since the 1970's researchers working both in the field and in aviary settings have provided data to indicate that natural parrot vocalizations are meaningful: Social interactions between mated pairs and among flock members are accompanied by a great deal of talking, and not only the physical structure but also the appropriate use of these vocalizations seems to be learned.Such findings on sophisticated vocal behaviors, when taken in conjunction with the data on complex problem-solving abilities (one study gives parrots the same success rate as humans in a comparable study) show that parrots have a level of competence of a chimpanzee,dolphin,elephant or a young human. 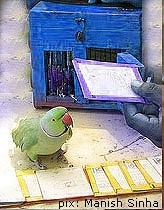 Scientists grudgingly admit that parrot Intelligence surpasses that of dogs and cats - sometimes even their owners! With this large brain power comes strong emotions.They are boisterous, playful, loving and also prone to fits and tantrums. Parrots I the wild are as noisy as humans.They chatter, mock, squeak, beep, grumble, groan, growl and scream. How many people realize that an intelligent creature needs constant stimulation. How many simply put the bird in a cage and leave it there. 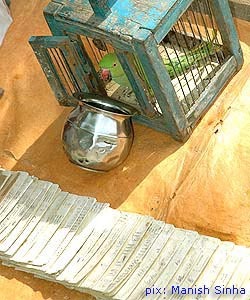 In the only study (Goverment Degree Collage, Saidabad, Allahabad )done on parrots in India to establish their emotional intelligence the researchers reported that " Parrots make meaningful use of vocalization and are able to associate words with their meanings and form simple sentences. Parrots can remember names of family members and can distinguish instruments and their use . We have found out that parrots are very good learners. They also have emotions like human beings such as jealousy, love fear anger or friendship" How intelligent are parrots in the wild ? . Keas, New Zealand parrots, in a neat variation of ringing the doorbell and running away, are known to drop rocks on roofs to make people run outside. Of the 140 parrot species of the West , 30% are almost extinct. 35% are almost extinct in South America and Asia.40 % of the species are threatened by the cutting of forests, 17 % by trade, 36 % by a combination of the two causes. More than 30% of these traded animals are taken from their nests and packed into small boxes and smuggled in trucks under other material across borders. They die of suffocation,starvation,inhumane treatment.Ten species of parrot have gone extinct simply because museums needed specimens .171 species are currently on the list of endangered species. Their colours ,mannerisms and ability to talk make them the target of trappers for the pet trade. When was the last time you saw a budgerigar or love bird in the wild ? Never. They used to live in large groups of upto one lakh in a single flock in Australia. Now you just see them in pet shops.From the tiny Buff-faced Pygmy Parrot from Papua New Guinea to the largest Hyacinth Macaw in South America all of them are being killed by bird fanciers. .
People who would never think of locking up a cat or dog in a cage don't worry about buying parrots  who are every bit as intelligent and aware as these animals  and keeping them in cages for their entire lives. Are you one of them ?